Andrejs Debesnieks is excited. For the first time in the four years since his arrest at Peru’s capital city Lima’s airport for transporting 1.5kg of cocaine in his stomach, he is being visited in jail by a woman from Europe. I have arrived unexpectedly. During my interview two days ago, I had to decline Andrejs’ desperate plea for me to come back a second time. He promised to tell me everything “that really goes on here”, but without the video camera running, though I’d already purchased tickets for my flight to Brazil to visit the next jail. But Peru played a joke on me once again. I got swindled. It turns out that the ticket to Brazil was invalid. I got back the 500 dollars I’d paid with the help of the police. A few days previously my credit card data got copied and 600 dollars were stolen from my account. I’m left without a bank card with cash in a country where even the locals are fearful of talking on a mobile phone in the street, and there are chains at the tables in cafes so that the ladies can attach their handbags to them. Tired of the sun and the lies, I postpone my trip to Sao Paulo and decide to visit Andrejs a second time. The fit looking blue eyed man has a confused smile on his face as he feverishly washes the floor by his bed. I sit down on the edge of his bed. In actual fact it’s a concrete bunk covered with a mattress. On a small table at the foot of the bed, there’s a ceramic dwarf with a red hat, in which one can place incense sticks. Andrejs likes to use it in the evenings, when before going to bed, he smokes some grass to take away the stress. Otherwise he can’t fall asleep. The hopelessness drives him crazy. About 25 people from the Baltics are serving their sentences for transporting drugs in the ANCON2 Prison, where Andrejs Debesnieks has spent his past years. The prison director tells me that there are only 18 people from the Baltic States here but I don’t believe him. I have met at least 20 drug couriers from the Baltics here myself. In the past two weeks other civil servants in Peru have been trying to feed me half-truths too. Peru is one of the world leaders in the manufacture of cocaine and the most drug couriers from Latvia can be found specifically in its prisons. “Drug mules”, as the police and academic researchers call them. Andrejs is one of them. A step away from Andrejs’ bed there’s a concrete cube in the middle of the cell, a few square metres in size, which includes a basin and a hole for a toilet in the floor. On the wall opposite Andrejs’ bed there’s a stylized drawing of a man with flowing hair. Andrejs borrowed the image for the sketch from his Polish cellmate, who, during my visit, is reading a book on his bed by the opposite wall. The Pole, with his hair gathered up into a thin pony-tail and with colourful designs on his forearms, is a tattooing specialist. A second sketch is still being developed — a soldier with a sword from an old Arnold Schwarzenegger film. Andrejs shows me some coloured pieces of glass in a small jewellery box, with which he’ll later decorate the drawing. Having grown up in Latvia’s city Sigulda, he is trying to make the blue coloured cell look a bit more homely. There are four double bunk concrete beds in the space which is about 10 square metres in size, but there are only four of them living there. 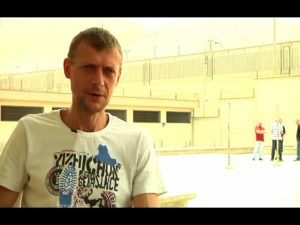 “There was a drug addict here with us, but we chucked him out,” explains Andrejs. The “drug addict” was tormented by paranoia and had once started a fire in the cell. It’s not hard to throw a cellmate out in a Peru prison as long as one has some money with which to pay the guards. Just about anything is possible in a Peruvian prison if you have money. Having put down his mop, Andrejs flicks off some invisible crumbs from the white plastic table, which is covered by a flowery wax-cloth. A bit confused, his cellmate Darius Šablevics (38) from the town of Liepāja in Latvia, shuffles around next to him. He is also tall but a bit clumsy. Andrejs and Darius keep together as it’s “safer that way”. At least there is someone else who you can trust in an environment where you can’t trust anyone. The story one hears from both cellmates is a classic one which I hear from many of the prisoners. They agreed to be drug couriers due to the financial crisis and were arrested at Lima Airport in 2009. In that year, the level of unemployment in Latvia reached 20%. Used to a comfortable life and easy loans in the “good years”, people tried to get by as best they could. Up to 200,000 left Latvia to work in other countries, with some of them – looking for a solution through drug trafficking. Andrejs was carrying the cocaine in his stomach, Darius — in his suitcase. The “crisis phenomenon,” is how Latvia’s Police Chief Ints Ķuzis explained the bourgeoning drug transit business when I was still in Latvia. Representatives from the Ministry of Foreign Affairs even compared the drug courier problem with the fake marriages problem in terms of its seriousness. Both of these took off because of the crisis. A similar trend was observed in neighbouring Estonia and Lithuania as well. Lithuania’s Honorary Consul in Peru told me — during the heat of the crisis in 2009, he’d receive a telephone call at least once a month about another Lithuanian drug mule who’d been arrested at the airport. The flights to Europe usually leave at night and that’s why the police woke him at night. “Go and buy some coffee,” Andrejs shook some coins out of a tin can and gave them to Darius. Meanwhile, he put some water on to boil. He placed a little metal plate connected to some electric cables in a plastic container. He put the other end into the electrical socket. Today is visitors’ day and there’s electricity right up until five in the afternoon. Every other day there’s a few hours in the morning and a few in the afternoon. Andrejs makes the remark “prison school from Latvia,” as he points to his homemade water boiler. He’d served a sentence at the Rīga Central Prison for repeated aggressive driving. 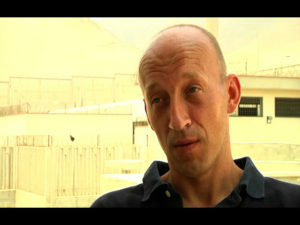 Andrejs was released before the end of his term on the condition that he didn’t leave Latvia. He breached this. He travelled to Peru to make some easy money and lost his freedom again. Andrejs’ coffee comes just at the right time. I’m exhausted. It’s Wednesday, one of the two days in the week when only women are allowed to come and visit the inmates. To reach Andrejs’ cell I got up at six in the morning. You have to be at the prison gates early to get in the line where you have to stand at least two, and sometimes four hours. February is the hottest summer month in Peru, and all the windows in the bus are already open early in the morning. I get out on the side of the highway by some dusty huts where basic necessities are sold. There are motorized rickshaws all around. They are ready to take you to the prison for the equivalent of 30 euro cents and 40 to get back. They take 60 from me as I’m a European. A white person in Peru is a walking ATM. 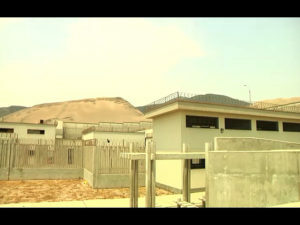 The ANCON2 Prison is located two kilometres from the highway on a sandy hill which is surrounded by even larger and more desert-like hills. Arriving at the prison gate at around eight, there’s already a group of women in front of us with large glass fibre bags covered with cartoon characters. Winnie the Pooh, the Little Mermaid and Cinderella are staring at me. Some of the women are visiting relatives, but the majority are selling goods to the prisoners. The guard writes my number in the line — 89, on my hand with a Flo-Master pen. I am about to sit down on the concrete edge at the end of the line when I am addressed by a young woman with bright white teeth and turquoise coloured earrings, which contrast beautifully with her dark skin. Clementina Farfan is a volunteer who reads the bible with female prisoners a number of times a week. Clementina speaks English which is very rare in Peru. Even some of the personnel at Lima Airport can’t, let alone the prison guards who only speak Spanish. Clementina studied chemistry in England and Australia for a number of years where she also found God. Clementina warns me that I won’t get into the prison because I am wearing trousers. They only let you into prison if you’re wearing a skirt. It’s harder to hide drugs that way and it’s easier to search the visitor. In this prison 98% of the prisoners use drugs and most of them are brought in by the women. That’s why Clementina is forced to remove her underwear every visit and has to bob down a number of times so that the guards can be sure that she hasn’t hidden anything illegal on her body. Clementina finds this demeaning. I’d heard about the demand for skirts but I’d forgotten about it. Two days earlier when I’d arrived at the prison with a film group to film material for a documentary, I’d worn trousers. But that time I was together with a representative of the INPE institution which supervises the prisons and nobody paid any attention to what we were wearing. Clementina works out a solution — I’ll have to drive back down to the dusty huts at the highway where I can hire a skirt for 30 euro cents. I also leave my sunglasses and an old borrowed mobile phone at one of the tent-like huts for safekeeping. They aren’t allowed into the prison. The prison gates open at nine. The next boring hour is spent on benches, but under a canopy. ANCON2 is a modern prison which opened in 2011 and has 2,300 beds. There are 1,600 inmates at the prison currently. The prison is divided into four modules and further into a number of pavilions. I am interested in the fourth module where there are 350 foreigners. I also visited the first module, where Laura Kalendarova (25), the only woman from the Baltics is imprisoned. She’s already been waiting for a decision by the court since 2011. A cocaine capsule in the stomach of Laura’s boyfriend burst at Lima Airport and he’d died at hospital. Laura says that she knew nothing about the drugs. The line moves slowly. We enter the prison building where passports are handed over. They write the number of the pavilion to which I’ll be heading on my hand. A little further in the line a gaunt woman with a tired face is standing there talking to her girlfriend while her two year old son is feeding on her breast. Women here breast-feed children anywhere, on the street, in cafes, and even pushing shopping trolleys in supermarkets. The next part is the security check. The guards quickly spread the contents of the large bags on a long metal table — soap, toothpaste, rolls of toilet paper, rice and vegetables. The guards cut any fruit with long knives or poke them with long needles. These are very important goods for the prisoners as the prison doesn’t give them anything, but just enough food to survive on. There’s jam and white bread for breakfast. For lunch there’s semi-boiled rice and meat, which could be from a whole boiled cow’s head, with the hair and eyes and all, or lungs, for example. For dinner there’s rice again, and the same thing every day, every year. Later a prisoner remarks “I will never eat rice again in my life”. I have brought along red coloured lemonade as a gift. Dark coloured drinks like cola are not permitted. Another time when I visited Laura, the Latvian woman, they took a mango away from me. The prisoners prepare alcohol from these and from grapes, pears and apples as well. I also have to throw away the Times and my New Yorker magazine, which I’d brought along to while away the time. I can’t understand why. The Latvians later tell me that “The guards will probably sell them to the prisoners later”. After the bag check, I enter a little concrete room with a female guard. Clementina warns me that the woman in the INPE uniform could tell me to remove my underwear. I get by without this indignity and the guard just does a pat down. After a few minutes I’m standing alone next to long sun heated concrete corridors. My eyes hurt without my sunglasses. I feel like I’m in a fantasy film — there are no people and one can hear the sound of televisions and prisoners’ voices through the narrow prison windows. It’s lunchtime. Four hours have passed since I arrived at the prison. I arrive at a control point, where huge barred gates divide off the entrances to the four prison modules. I receive the next stamp on my forearm — a smiley face with a phrase written in Spanish “How can I help?” This is the sixth stamp already. My arms are also decorated with a large butterfly, a bear and a fox. I enter the gate with the sign M4 — fourth module. First of all I’ll visit the Estonian drug couriers, whom the INPE didn’t allow us to film, and after that — Andrejs. The idea of making a documentary about Baltic drug couriers occurred to my colleagues and me last summer. The statistics were frightening. In one year, about 230 people from the Baltic States were arrested in foreign countries for drug trafficking. Thirty from Estonia and a hundred from each of Latvia and Lithuania. They transported drugs in their stomachs or in their hand luggage from South America, Asia and Africa to Europe — Spain, Holland and England. Police estimate that overall only about 10% of couriers are ever arrested. According to these calculations, more than 2,000 Balts are involved in the drug business. The “World Drug Report 2012” prepared by the United Nations shows that in recent years the trend to use young men from Eastern Europe as mules to transport drugs has increased. Due to the crisis they are more easily seduced by the promises of quick money, which can range between 2,000 to 6,000 euros for bringing over one load. During the crisis the sum was reduced as it was easier to find couriers. “Do you think we really had to convince them? We just let the news out and they signed up themselves,” a drug mule recruiter who is now awaiting trial in Latvia resentfully barked at me. The use of couriers has also been encouraged by the growth in cheap flights around the world as a result of which the use of airline flights for transporting drugs has increased by 80% in the past decade. Organized crime finds it expedient to use live couriers, rather than just taking risks transporting huge volumes by ship. As a comparison: a kilogram of cocaine with a purity of 90% costs 1,000 dollars in the jungles of Peru. In America its price will be 25 000, in Belgium 50,000, but in Japan — 120,000 dollars. An airline ticket to Lima from Europe costs about 1,500 dollars. The profit is impressive. The report also mentions that the most common cocaine transporting nations are Bolivia and Peru, where the tradition of growing coca bushes has a centuries’ old history, there’s a suitable climate, corruption and thick jungles, which make the identification of drug production from satellites difficult. The UN indicates that in 2009-2010, cocaine use in Eastern Europe increased threefold, while in Western Europe it halved, influenced by the above mentioned facts. International experts link the increase in drug use with socio-economic factors – unemployment, social inequality and a decrease in incomes has encouraged those affected by the crisis to seek solace in drug induced euphoria. Income inequality in Latvia and Lithuania is among the largest in the EU. In his office in a multi-storey building in the centre of Lima, Peru’s DIRANDRO Police Drug Unit’s Major Renzo Caballero tells me that in recent months drug dealers have been transporting the cocaine to Brazil or Ecuador first of all and only then to Europe. The flow has decreased since the beginning of 2013 as control was tightened and the number of couriers caught at Lima Airport has decreased. A television can be heard in the background, while Caballero fiddles with his iPhone and boasts that last year the police confiscated money, drugs and property worth 52 million dollars from the drug cartels. “I was working in construction in England. There was a black man in the house which I was sharing with other workers, who offered to help me find a job in construction in Peru,” says Estonian Margo Tamm (31). Lima Airport Security arrested the tall man with a high forehead and square jaw in 2010. I strain to listen as it’s difficult to understand Margo’s Russian as he has a strong Estonian accent. We shout to each other in the narrow corridor which is divided off by a barred gate. The guard has summoned Margo from his cell, but meanwhile other men hang around behind the bars, urging me to definitely see them as well. Margo’s story coincides with the typical drug mule description heard by the police and the Baltic States consulates — a person from a low income family (Margo has four brothers and a sister who work in agriculture), working in Europe (usually in construction), meets a “black man”, and travels to Lima, where there’s already a hotel room waiting for him. The couriers usually spend 7 to 11 days in Lima so that they look like the typical tourist. Shortly before flying out, someone gives them a bag which has to be delivered to Europe. If the courier is a swallower, he is given cocaine capsules packed in rubber condoms. Margo has another characteristic typical of many couriers — he denies that he knew anything about the drugs. Margo tells us that he travelled over for a job in construction, but didn’t get it, and he was asked to take a bag, which was stored at the hotel, back to Europe. The Peruvian courts don’t believe these stories — if a bag at the airport is registered under Margo’s name and there’s a kilogram of cocaine hidden in the handle, he is guilty. Six years and 8 months in prison is the standard penalty. After an average of three years in prison one can apply for an amnesty. Before that one has to pay a fine of about 1,400 euros and find a person in Peru with whom one can stay on release from prison. After submitting the documents one has to await a decision which could drag on for an indeterminate period. Nothing is definite in Peru. The court hearing may not take place because the judge is in a bad mood. Or one’s lawyer may cheat you, taking your money, promising the world and then disappearing. A prisoner also has to collect bonuses for good behaviour to get a positive amnesty outcome. One can get this by working or studying in prison. Margo can’t do this because he doesn’t have any money, either for his studies, or for the opportunity of working, for which he’d have to pay on average 7 euros per month. Studying means going to the creative workshop each day where it is possible to learn Spanish and make crafts from various material off-cuts. A prisoner can also do the same at “work”, only then he/she has to buy the materials. The leather purses, ornaments or ash trays made from the materials can then be sold to visitors. For a while, Margo earned some money by washing clothes for other prisoners, but now there’s no more demand. His relatives can’t send him any money. 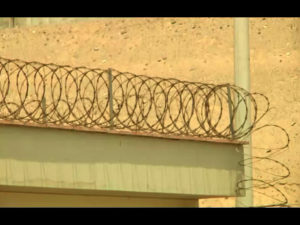 About 70 euros per month is needed to live relatively normally in a Peruvian prison. Margo has lost 10 kilograms in weight due to the poor food. The Baltic countries also don’t provide any assistance to their citizens. The local Baltic honorary consuls in Peru fulfill more of a representative function and assist in the preparation of documents. This is important as the passports of the majority of the prisoners have already expired by the time they are released from prison. But a passport is important for escaping Peru. That’s another absurd thing about Peru. After being released from prison on parole, the courier has to spend the remaining period of the sentence — on average three more years — in Peru. He’s not allowed to leave the country. He can’t officially work as he doesn’t have a work permit. When the entire period of the sentence has elapsed, the courier has to pay a fine to the migration service for having stayed in the country for more than the permitted 90 days. A dollar has to be paid for each day overstayed, and therefore it’s about 2,300 dollars for a person who doesn’t have any income. To bypass this absurdity, couriers with valid passports pay a bribe and cross the border into Ecuador or Brazil and then fly home from there. “Money, money, money. One has to pay for everything here,” Margo is indignant. One even has to pay on entering prison. It’s a semi-legal payment to the pavilion elder for the opportunity to watch television or to get a mattress. On another day in the women’s pavilion, a Maria from the Philippines told me how glad she’d felt on finally getting a blanket. A prisoner who’d been freed left it to her. Maria had cried from happiness. Still, the prisoners say that the living conditions at ANCON2 are better than at Sarita Colonia, where everybody spends the first year of imprisonment. At the mention of this “hell”, the couriers wince in disgust. 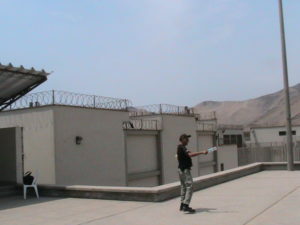 The overcrowded prison is located in Callao, one of the most dangerous districts in Lima. When we travel there to film a court hearing, our operator Carlos refuses to get out of the car with the camera. All of the couriers remember how they slept at Sarita Colonia, two or three to a mattress, which was only unrolled in the evening in the wide cells. When the mattresses were unrolled there wasn’t any space left on the concrete floor. After nine o’clock in the evening it wasn’t possible to go to the toilet — the inmates had to use plastic bags or bottles right there for their ablutions. The toilet was simply made up of uncovered pots placed in a large room, at which everybody standing in line was forced to look. “As there were queues everywhere,” said one of the couriers. However, everyone fondly remembered the freedom which prevailed in this hell. During the day one could just wander around the prison territory. There was even a restaurant run by the prisoners themselves where one could purchase hamburgers and hot dogs. There were always mobile telephones smuggled in illegally and the Internet was at hand. This sort of freedom doesn’t exist at ANCON2. Estonian Varmo Tamm (24), who has already been in Peru for almost three years, really misses it. He was detained at the airport with four kilograms of cocaine, which were strapped to his legs in eight packages. “I really want some pelmenji and strong mustard,” says the short man with a child-like open face, “They eat anything here — cow’s stomachs, guinea pigs and rats. They don’t know what pelmenji is.” As opposed to most of the prisoners, Varmo is a wonderful storyteller, that’s why while listening, I was fuming internally at the INPE, which wouldn’t allow us to film the Estonians. This is already the third time that I’ve visited ANCON2. 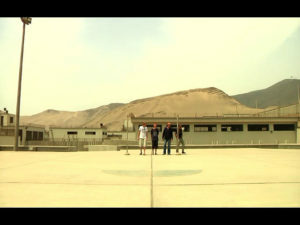 Arriving in Peru at the beginning of February, my main goal was to get permission to film within the prison. After a number of months of working with colleagues in Latvia, we found out that we wouldn’t be allowed to film inmates in Spain, Ireland, or even Estonia as this was forbidden by EU regulations. 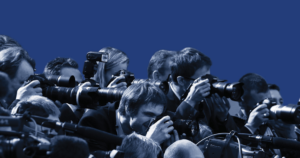 Attempts to find local journalists in Mexico and Panama, so that the Balts in the prisons there could be interviewed, were unsuccessful. On finding out that the greatest numbers our people were confined in Peru, we understood — we have to go there! Initially I planned to get into the prison together with Edmundas Putrimas, a Catholic priest of Lithuanian background who grew up in Toronto. He’d already visited the prisoners in Peru and Brazil previously. After a number of weeks spent coordinating this, I entered ANCON2 for the first time on a Friday in February together with Edmundas, who is a sincere bear of a man. My task was to get permission to film interviews with a few of the couriers. According to the procedure, they have to sign special consent forms. Previously, we’ve been unable to convince former couriers from the Baltic States to grant us interviews due to their shame, or even a fear of retribution from their recruiters. For most of the couriers this is an unfounded fear, as they don’t even know who the real organizers of the criminal enterprise are. Consequently, they’re not even able to turn anyone in. According to stories from the police in Latvia, Lithuania and Peru, there isn’t one specific organized crime group coordinating the couriers in the Baltic area. Recruiters who are coordinated mainly by representatives of organized crime from Western European countries operate in the Baltic States. In most cases the recruiters themselves don’t know who the people are on the other end of the telephone in Spain, Belgium, England or Holland, where our couriers are later arrested on their way back from South America. At the moment, Latvia’s law enforcement institutions are working on at least three large criminal matters where drug couriers were recruited. The attitude of the couriers at ANCON2 was different than I had expected. The prison guards called all of the Balts together. One after the other, they came out into the little inner courtyard, until at one moment I’d lost count and my ears started ringing from the conversations. Finally there were at least 20 men, aged between 20 and 50, surrounding us — some a little overweight, some looking famished, or the exact opposite, quite sporting. There was almost a feeling of celebration for them, as for many this was the first time in many years that their “own people” had come to visit. I’d brought along about ten forms but these weren’t enough. I promised to return next week with the camera. I didn’t honour my promise. Peruvian custom saw to that. The Monday and the Tuesday of the next week turned out to be national holidays in honour of Valentine’s Day which was coming up on Thursday, and therefore the INPE wasn’t working. Early in the morning on the Wednesday I handed in the inmates’ consent forms to the press secretary, Janet Sanchez. She gave me an indication that I’d be able to get into the prison on Friday. But on Thursday she was no longer answering the phone. I headed to the INPE office where ceiling fans were quietly whirring. Janet explained that she’d sent a request to the Latvian Honorary Consul to confirm my identity. I rang the Consulate. It turned out that Janet only planned to send the email. 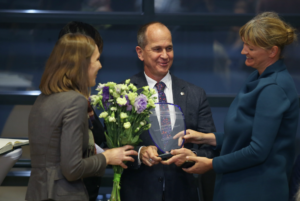 Understanding that INPE was trying to waste time, on Friday morning I asked the Latvian and Lithuanian honorary consuls to ring Janet. Both gentlemen are wealthy Peruvians and status in Peru has great significance. This strategy turned out to be the right one and Janet became very receptive. But another hurdle appeared unexpectedly — the Estonian Honorary Consul. It transpired that Janet had also asked him to confirm my identity although in the previous week she hadn’t mentioned a word about it. I rang the Estonian Consulate. The Consul was out of town at his summer house, but the secretary had resent the INPE letter to the Estonian Ministry of Foreign Affairs for confirmation. Such is the procedure. As the INPE had promised to let us into the prison on the Monday, I understood — we wouldn’t be able to get permission to film the Estonians in time. On Monday morning we arrived at the prison with a representative of the INPE, a gentle creature called Miluska. We sat around bored for two hours waiting for the Director to return “from a seminar”. Carlos, the operator fell asleep in the heat with the camera in his lap. It turns out that of the initial 10 people we’d planned to interview, we’d only be able to do three. No Estonians, Laura is sick, and a number of the Lithuanians aren’t permitted to speak because of their bad behaviour. We are shown an empty courtyard with a small canopy for the interviews. Miluska takes off her high heeled shoes and pulls some sandals out of a bag. She puts on some sun protection cream and thoughtfully gives us some too. After a moment all three interviewees enter the courtyard — Andrejs, Darius and a young Lithuanian lad. We talk for two hours and then Andrejs asks me to come back again, but without the cameraman. Due to the ticket fraudster and the postponed flight, I can grant his wish two days later although it hadn’t been planned. “I’ve lost the best years of my life here,” Andrejs tells me, drinking coffee and eating some melted chocolate biscuits in his jail. “I started here when I was 32 years old. Now I’m 36. I still have to start a family.” I hope to meet Andrejs once more before autumn when our film will be released — by that time in Latvia. He tells us that he’ll be released from prison soon. He still wants an opportunity to live his life.